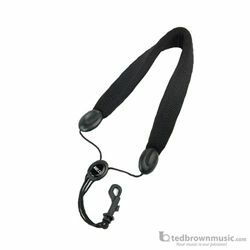 The Rico padded saxophone strap for tenor/baritone saxophones with snap hook features padded memory foam that provides extra comfort on your neck. Each strap is covered in a breathable, athletic material that is comfortable and stays dry. All Rico saxophone straps feature a unique quick-adjust slider, which allows the musician to adjust the strap to a precise length, quickly and easily. Rico sax straps use cords that are much less cumbersome than traditional webbing.